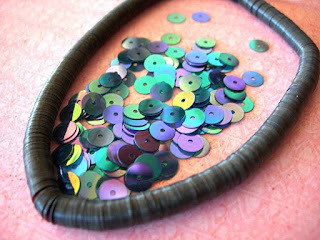 This entire month, for the first time I'm putting all my vintage sequin strands on sale -- 10% off, no minimum order (usually you have to buy 5 strands to get the discount). 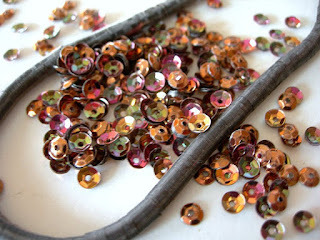 Specialty sequins are not discounted, but all others are. Here's a direct link to the sale items: https://www.etsy.com/shop/seriousbeader?section_id=1 . I will be adding a few more colors, sizes and styles throughout the month, but meanwhile here are some special lovelies to consider. 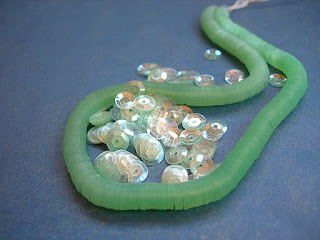 Iris, AB (aurora borealis) or rainbow-coated flat sequins cover a lot of ground in your embroidery projects. These little copper iris cups look like rhinestone crystals in your work, but are light as a feather. Layer transparent sequins over each other on patterned fabric, for interesting and subtle effects. 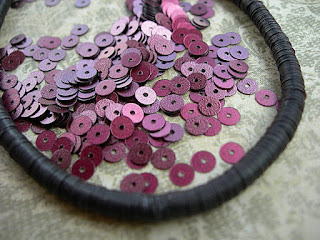 Matte sequins aren't as reflective but they're rich in color! I have these plum beauties in 4 styles -- small and medium in both cupped and flat. Great for floral motifs!